Would 8GB 0f RAM fix this problem? Discussion in 'MacBook Pro' started by dslade09, Aug 12, 2011. I just want make sure I understand the page in/out and swap. The bigger the swap the more it transfers from the hard drive to the RAM? Therefore if there is more RAM it would not have to swap as much? I have pic attached at the bottom. The key is the page outs. Yes 8GB would certainly help in this case. Restart your computer. That resets page outs and swap used to zero. Now track those values under your normal workload. It's OK to occasionally page out, but if it's happening frequently under normal use, you may need more RAM. I wouldn't consider more RAM until your page outs/swap used are consistently in excess of 1GB under normal use. Probably more. It dose when I'm in Aperture working with RAW files and Photoshop it pages just like you see in the screenshot. I have 8gbs on order from newegg. Thank you for the quick response. 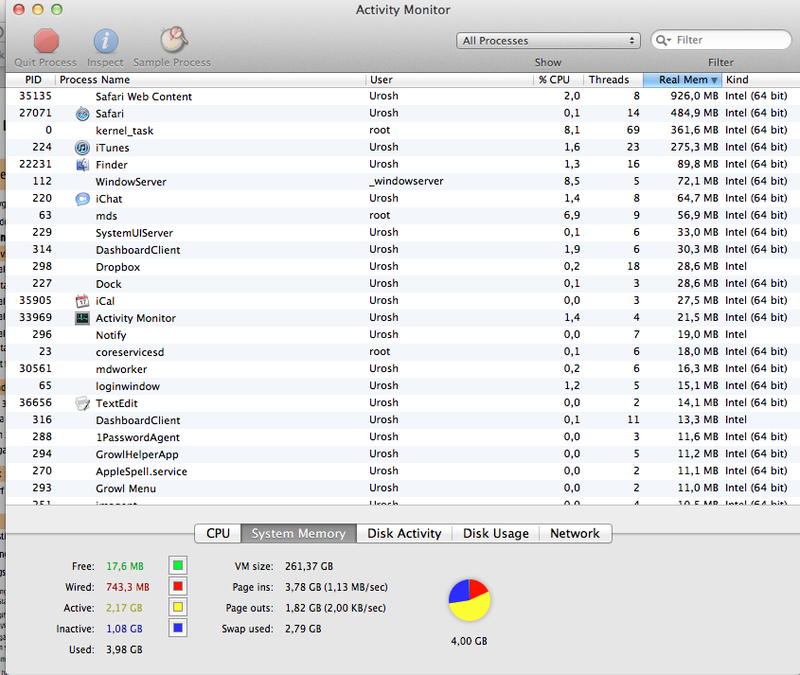 A little bit over 3 days uptime and used only: Safari (no flash! ), iCal, Adress Book, MSN, Skype, iChat, occasional Chromium and ran Numbers once as well. I didn't read it all, but this thread may provide some insight. Yep, I'm noting at least 2x the RAM usage under the same usage conditions as before I updated. I'm constantly swapping to my SSD and I'm concerned that my SSD is getting butthurt. After a few hours of browsing with Safari, I notice that it lags like nothing else and is usually consuming ~3GB of ram... any tips? If you have the AdBlock plugin installed there is a MASSIVE memory leak with it on and the new safari. Im not sure if you have that plugin but when I turn mine off the web content will not draw that much memory. More Is Better, and i think that 8GB of memory Are worth the investment ! !, Go for it. Yes, I do have AdBlock (along with ClockToFlash, FastestTube, 1Password and Facebook adblocker). I will disable AdBlock and see if it is any better. Thanks. Doesn't really work me either. I have rebooted the machine and used Safari with only ClickToFlash. It did, however, extend the time before all of my memory was used up. So, instead of having to restart Safari every hour, I now have to do it "only" every couple of hours. Can't wait for the fix...web is really ugly with all the ads. I found the same thing NazgulRR did. Disabling AdBlock really raised the amount of time I could go before Safari ate my memory up, but it still seems to be eating quite a bit of it. I've switched over to Roccat browser and have been trying out RockMelt as well. RockMelt is so cool it hurts my brain. And for less than $80, even close to $40!, a worthy investment. Especially if you are interested in running any VMs. Time to switch to Chrome. I found that Chrome still sucked up RAM but just didn't report it in Activity Monitor. After running Chrome for a few days my available RAM would still dwindle to 50 or 100 MB, though Chrome only showed using maybe 80MB of RAM. Quit Chrome and suddenly there's 500MB of free memory. Thanks for that rockmelt tip..this is a cool browser!